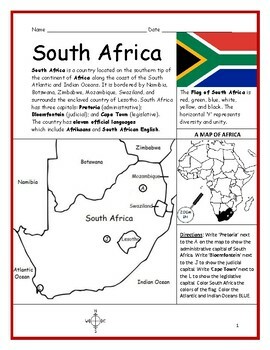 Introduce your students to the country of SOUTH AFRICA with this printable handout of two worksheets (plus answer key). Your students will read a brief overview of South Africa (location, capitals, flag, language), write 'Pretoria' next to the 'A' on the map to show the administrative capital; write 'Bloemfontein' next to the 'J' to show the judicial capital; write 'Cape Town' next to the L on the map to show the legislative capital, color the small map, and use the map and compass to answer 9 questions on page 2. 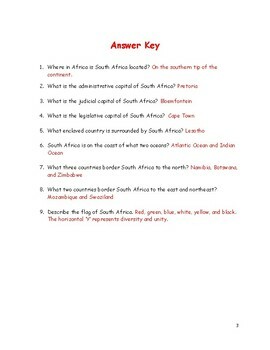 Basic Geography Worksheet with a simple map to introduce South Africa and practice cardinal and ordinal directions. Colored pencils and a pen or pencil are needed for this activity. More to come soon! Please FOLLOW THIS STORE for more printable handouts. Thank you so much for using my Geography worksheets in your classroom! I hope you find them useful. Reviews are welcome and very much appreciated.